This recipe makes about forty cookies. I did cut some in half. Traditionally dipped into a class of vin santo. However, these are very light and great for eating alone. There is just a subtle anise flavor from the flavored liquor that was added. In a bowl, combine the butter and sugar. With a mixer, beat in the whole egg and then add the other yolks one at a time. Beat until light and creamy. Stir in the anise and lemon zest. In another bowl, mix the flour and the baking powder together. Add the flour mixture to the egg mixture and mix until blended and a dough consistency forms. By hand, mix in the almonds. Shapes the dough into two loaves, 3 inches wide and 1/2 inch thick. Transfer to a parchment paper lined baking sheet. Bake for thirty minutes. Remove the sheet from the oven. Cool just for a few minutes and cut the loaves with a serrated knife into slices about 3/4 inch long. Turn the cut slices on the baking sheet, cut side down. Return the slices on the sheet bake into the oven for an additional 25 minutes at a reduced heat of 275 degrees. Bake until they are dry and lightly colored. Remove from oven and transfer to a rack to cool. 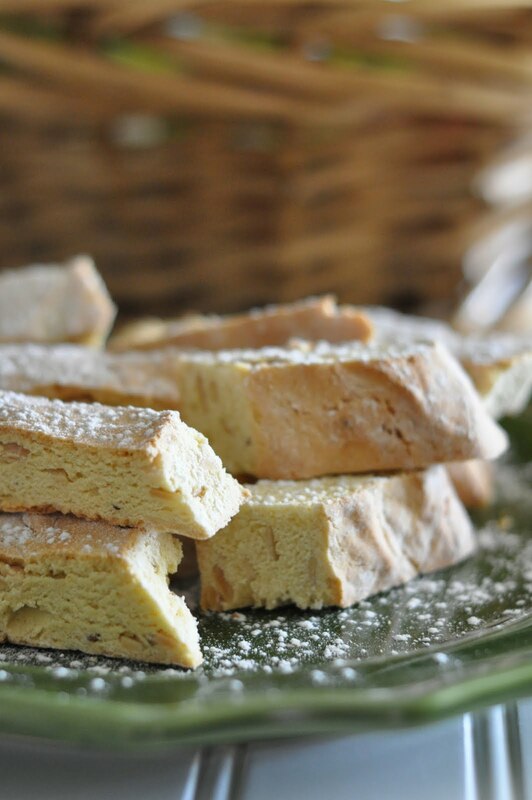 The biscotti will keep up to 2 months in an airtight container. But, good luck with that~they won't last that long! What a lovely treat! Wish I had one now. Thank you for sharing this great recipe. I will bookmark it. Since I don't have much of a sweet tooth this is the perfect recipe for me. Your photos are excellent, Jann. Wow. Your biscotti looks so elegant with the powdered sugar. I love the anise flavor in them and I always have a bottle of Pernod in my liquor cabinet. You never know when you might crave a Pastis. What beautiful photography....great posts and wonderful traveling! A feast for the eye.. 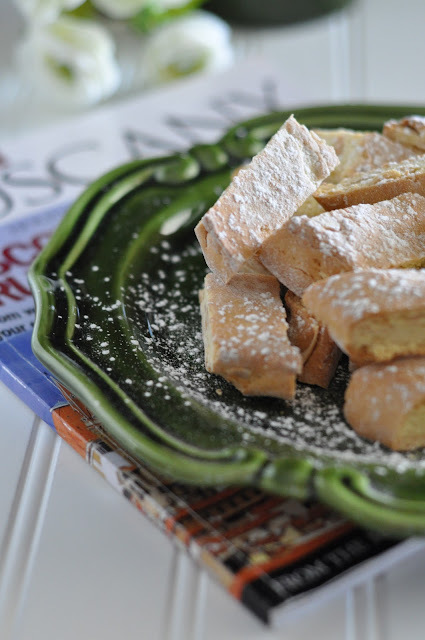 These look very much like a recipe our Italian neighbor made every holiday as we were growing up. We loved to get these cookies as a gift. Eventually, I got the recipe and still make them each Christmas. Beautiful looking cookies, Jann...your photos really show off the texture & that little touch of powdered sugar...I can almost taste them! My DD's MIL makes them every Christmas but I've never tried. I think I might this year. Copying & saving your recipe...thank you!